At the time of writing, striker Adamu Mohammed of Gombe United FC, based in the northeastern part of Nigeria, has scored nine league goals in the Nigeria Premier League 2010-2011, making him one of the revelations of the current season. Despite his success, it’s very difficult to find information about the player, partly because the name “Adamu Mohammed” is rather common in Nigeria, partly because the media coverage of teams from the northern parts of Nigeria is rather poor. In this post, I will try to draw a picture of an up-and-coming player that could very well become a household name in Nigerian football. My first record of Adamu Mohammed is from the Nigeria Premier League 2008-2009. As far as I know, Mohammed scored one league for Gombe United FC, during the season. Mohammed never joined Enyimba FC and he disappeared from my radar for a couple of months. However, I am pretty sure that Mohammed is the same “Adamu Mohammed” that played for Lobi Stars FC during the Nigeria Premier League 2009-2010. This player scored two league goals during the season and was invited to train with the Nigeria B national football team. Mohammed returned to Gombe United FC before the current season. Since Mohammed scored his first goal of the season on 12.02.2011 against Warri Wolves FC, he has simply been unstoppable. Based on match reports, Mohammed seems to be a classic centre forward that tends to score goals from crosses, obviously making good use of his body strength. According to SuperSport, Mohammed can also play as a right-winger. However, at the time of writing, I am still not sure if the information found on this page is 100 percent trustworthy. Mostly, the birthdates presented makes perfect sense. In some cases, the birthdates looks to be horribly wrong. Before I use the birthdates as the official ones, I will investigate a bit more about this Nigerian website. In other words, I am not able to confirm that Mohammed is about to turn 19 years old. However, he does seem like an interesting player and if any of my readers have more information about the player, please don’t hesitate to contact me. I guess it’s not often scouts travel to Gombe but it could very well be worth the hassle. Gombe United FC has several interesting players with Mohammed standing out. Others are youngster Mustapha Babadidi and the brilliant captain Alhaji Kwaranga (born 28.12.1987). 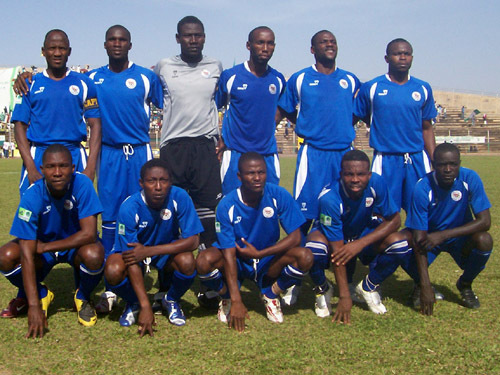 The picture is of Gombe United FC and is taken from naijaligue.blogspot.com.